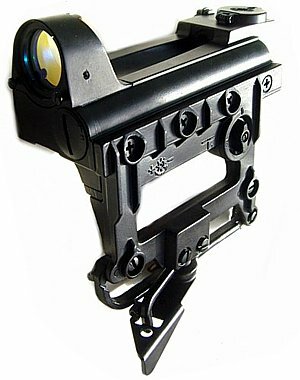 This quick-response sight is chosen by Russian special forces, because it never fails whatever the conditions. While aiming & keeping both eyes opened, you can keep visial control over the other potential targets. Cobra is ultra reliable (every new sight goes through tough 24 hr. testing), design for fast aiming - with both eyes open. The aiming reticules projection is not seen from target side. Traditional feel windage and elevation turrets; aiming marks intensity adjustment allows it to be used in the widest range of conditions - from dull indoor ranges to blazing outdoors; four different types of reticules can be selected by pressing a button on the side of the scope. The scope is waterproof. This sight used for AK/SAIGA.